Spicy cheese sauce enriched with creamy Hellmann's® or Best Foods® Real Mayonnaise is poured over toast and cooked to golden perfection. 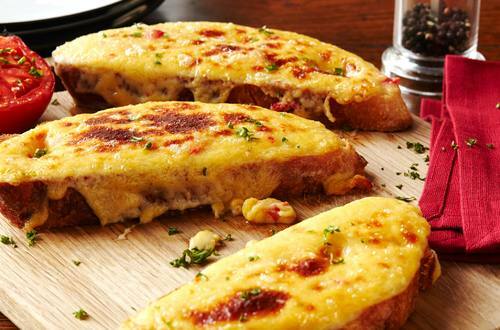 A tasty and filling Welsh Rarebit recipe. 1 Heat Hellmann's® or Best Foods® Real Mayonnaise with egg yolks over low heat, stirring constantly, 1 minute. Stir in flour with wire whisk and cook over low heat, stirring constantly, 1 minute. Slowly stir in creme fraiche, milk, Worcestershire sauce, dry mustard and red chili pepper. Bring just to the boiling point over low heat, stirring constantly. Reduce heat to low and simmer, stirring occasionally, until slightly thickened. Stir in cheese and cook over low heat, stirring constantly, until cheese is melted. 2 Spoon cheese sauce over bread to serve. OR, arrange bread on baking sheet, top with cheese sauce and broil just until golden and bubbling, about 1 minute. *To make creme fraiche, combine 1/2 cup heavy cream with 1-1/2 Tbsp. buttermilk OR 1/4 cup sour cream. Let stand overnight. **Substitution:  Use a few drops hot pepper sauce instead of roasted chili pepper.